The world’s most expensive player was in attendance at the final, watching on as he continues his recovery from foot surgery two months ago. He later joined in the post-match celebrations. “I am happy with our season,” coach Unai Emery, who is out of contract and will not stay on for a third campaign, told Eurosport. This was perhaps the greatest mismatch in any Cup final in modern times, with the Qatar-owned PSG — their revenue last year around 500 million euros ($596m) — coming up against a side from the lower reaches of France’s third division. Les Herbiers brought in the region of 15,000 fans — around the same as the population of the small town in western France — to enjoy themselves on a national holiday, and were greeted by scorching temperatures in Paris. 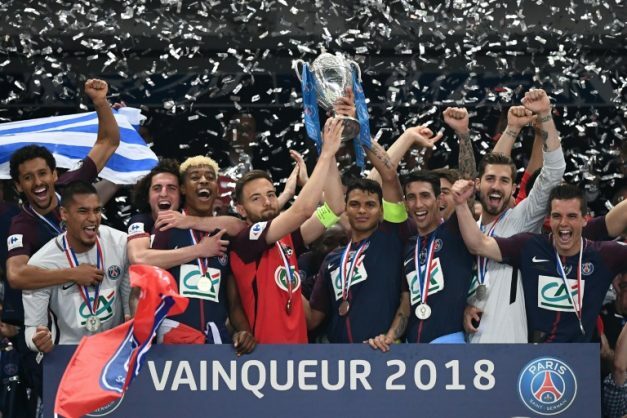 They were not let down by their team, and Les Herbiers captain Sebastien Flochon was invited to join PSG skipper Thiago Silva in lifting the trophy at the end. “I am very proud of my team. We hung on in there and avoided a hammering, and we might even have scored a goal at the end,” Les Herbiers coach Stephane Masala told France 2. “Paris are so strong, so fast, and they make all the right decisions. Many PSG supporters spent their energy prior to kick-off whistling French President Emmanuel Macron — a supporter of their sworn enemies Marseille — as he greeted the teams on the pitch.